Central vacuum attachment set ideal for the garage or any room needing its own hose and tools handy. This accessory set is a must for every home with central vacuum system. Each set comes with basic cleaning tools such as the crevice tool, the upholstery tool, the floor brush and the dusting brush. The set is compatible with all Husky accessories as well as most other brands. The Husky 10-Piece surface preparation kit is built to industrial standards for professional use. This kit is ideal for sanding, buffing and general surface preparation. The mandrel fits perfectly smoothly and easily into standard 1/4 in. Die Grinders. Kit features the ideal assortment to conquer even the toughest jobs. The Husky 5-Piece 3/8 inch Industrial-Style Quick-Connector Kit makes it easy to connect air tools to an air hose without discharging the air system. Air tight locking system for maximum pressure. Super durable for a longer life. The 3/8 inch body set allows greater air flow and includes one 1/4 inch NPT (F) coupler, one 1/4 inch NPT (M) coupling, one 1/4 inch NPT (F) coupling and two 1/4 inch NPT (M) plugs. Husky 6-Piece inflation Gun Kit includes one each rubber blow gun tip, raft inflator, sports ball inflation needle, tire inflator and adapter. Use the blow gun attachments for basic filling of rafts, sports balls and tires and for blowing dirt and debris from hard-to-reach areas in your workshop with the rubber tip nozzle. Great for all your inflation needs, too. Husky Garage Accessories Kit Central vacuum attachment set ideal for the garage or any room needing its own hose and tools handy. 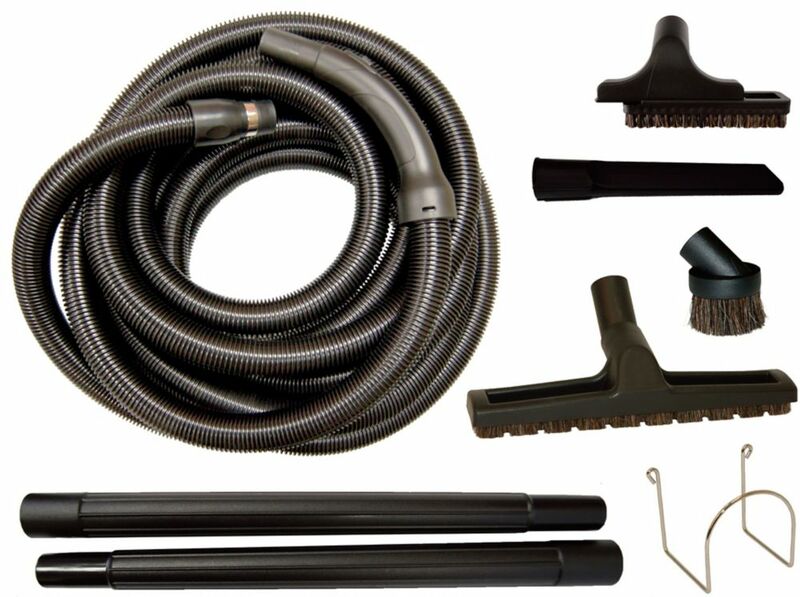 This accessory set is a must for every home with central vacuum system. Husky Garage Accessories Kit is rated 4.0 out of 5 by 5. Rated 2 out of 5 by HomeDepotCustomer from Although the price is on the cheaper end I guess... Although the price is on the cheaper end I guess it's a good value. The problem with this hose is the plugin at the was does not fit well and tends to fall out. It works ok for what I'm using it for and I didn't have to spend lots of $$$ for it. Rated 5 out of 5 by Janm from Just what I wanted! I wanted a lightweight hose and this is exactly what I was looking for. Attachments were a bonus! Great price! Rated 5 out of 5 by Dodger from Garage Vac Kit It's just what I needed. All the right attachments. Rated 3 out of 5 by Wes from Did not know that anti attic hose was really all... Did not know that anti attic hose was really all that necessary until trying to use this for sawdust. Does this hose come with a pigtail power plug? Why is this called a garage kit? Is it Not suitable for in home? Does this hose fit a Sears-Kenmore central vac system ... specifically a K-S107 / 34089. The outside diameter of this (Sears) hose measures 1.5 Inches.